L Frank Baum is best remembered as the author of The Wonderful Wizard of Oz (1900), but writing was certainly not his first occupation. Baum was, like many men of his generation, a jack of all trades and a master of none; he’d pursued a number of careers–all with little success. He went to Aberdeen, South Dakota looking for a fresh start…only to find himself running a new baseball club, the Hub City Nine. When Baum arrived in Aberdeen in 1888, the town was rapidly growing, and it wasn’t much like the stereotypical frontier town. Founded in 1881, Aberdeen was populated not with farmers and cowboys, but with college educated citizens who’d come West for cheap land. They arrived by train and immediately set about reestablishing life as they’d known it back East. Aberdeen’s citizens went to local events in full dinner dress. They enjoyed champagne and other delicacies. By 1885, assessment reports show that there were 135 pianos for a town of 2,500 people. Electric lights were available the following year. As far as Baum was concerned, Aberdeen lacked only one important thing: a baseball team. Though Baum had never been a great athlete, he’d undoubtedly played the sport casually and watched local club teams play in upstate New York. However he encountered the game, Baum was an enthusiastic “crank,” as baseball fans were then called. As soon as he settled into Aberdeen, he went about rallying support to start a club team. Baum convinced a group of Aberdeen businessmen that the city needed a baseball club. 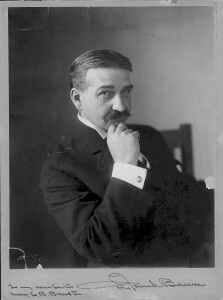 Baum so impressed the men with his enthusiasm, they named him secretary of the club and appointed him to the constitution and by-laws committee. They named the club the Hub City Nine, a reference to Aberdeen’s nickname as the Hub City because seven rail lines converged there. The first 210 shares sold at at $10 each in three days, and the remaining 90 sold shortly thereafter. Baum also spearheaded an effort to sell advertising space on the baseball field’s back fence. 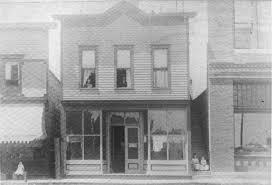 The group was so industrious and successful in their fundraising, it drew the attention of nearby communities. In the Fargo Daily Argus, baseball club manager Con. Walker complained, “The citizens of Aberdeen contributed $3,000 to their base ball team this season. The Fargo people have done nothing for the club in the last two years.” Walker entreated the town to support the home team if they wanted the club to continue and flourish. Even an “official” baseball size was new in 1889! 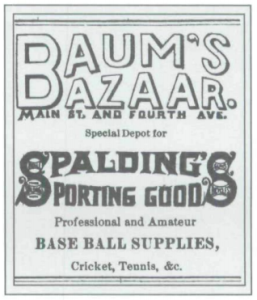 Baum and the other board members believed that organizing a league was critical to their success, so Baum headed up efforts to organize the South Dakota League. When the league was formalized on June 7, 1889, all the participating teams contributed $100. The Hub City Nine also strove to legitimize itself further by adopting the National League Rules. At the time, the rules of baseball had yet to be normalized, and the National League, Western Association, and American Association all had different rules. 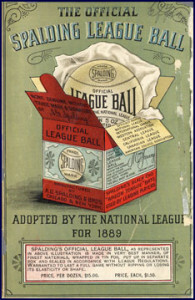 The National League, founded in 1876, was the oldest and most powerful of these organizations. When it came time to recruit players, the Hub City Nine offered $50 per month, plus room and board. To sweeten the pot, club president Jewett offered a box of cigars to the first man to hit a ball over the center field fence. Baum threw in another box for the player who hit the first home run. And local grocers Thompson and Kearney promised $25 to anyone who hit a ball into the “Hit Me for $25″ box on the fence where they advertised. On May 29, 1889, the Hub City Nine players gathered for their first practice. The event was free to attend, and a healthy number of spectators showed up to observe the proceedings. The first game, a warm-up against Redfield, sold over 1,000 tickets. There was not enough room in the stands to hold them all! Baum later managed to get the St. Paul Indians to come to town for a game. The club raised admission to 50 cents, from 25, and though people grumbled, they still purchased tickets for the game. The Milwaukee railroad ran three extra trains to bring the fans into town. The game brought sorely needed funds back to the club. These interloping spectators robbed the club of vital revenue. So the club installed latticework on top of the fence. Ives responded by outfitting his roof with higher chairs. Infuriated, team manager Henry Marple threatened to turn the stream of a railroad hose on the unauthorized spectators. Finally, the club had to hang canvas over the latticework.Yet Baum came to Ives’ defense. In an article for the newspaper, he argued that “Mr. Ives is not so black as he has been painted” and said that he didn’t deserve insult. Thanks to Baum’s conciliatory efforts, the conflict was resolved by July 25, 1889: Ives agreed to give the club jurisdiction over his property during baseball games. Baum’s Bazaar suffered the same fate. After scarcely a year in business, Baum suffered the “temporary embarrassment” of handing his business over to his creditors. He purchased a newspaper and renamed it the Saturday Pioneer. While the citizens of Aberdeen enjoyed Baum’s writing, the newspaper also folded after only a year. Baum could not handle the stress of being a business owner, and his health suffered. He took a job in Chicago working for a newspaper. The move would set in motion a series of events that resulted in one of the most iconic and beloved stories of the twentieth century, The Wonderful Wizard of Oz. Rare Books about Baseball Are a Home Run! This entry was posted in 19th-Century Literature, Baseball, Children's Books and tagged Aberdeen Base Ball Association, Baseball, history, L Frank Baum on May 13, 2014 by tavistock_books.